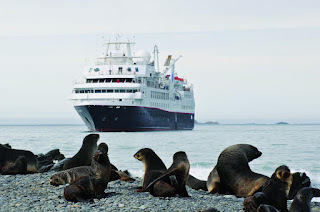 The renowned Royal Geographical Society (with the Institute of British Geographers), founded nearly 200 years ago to advance geographical science, is to enhance Silversea voyages even further by providing detailed scientific and historical information to guests embarking on some of the greatest journeys around the globe. The Society, based in London, and whose Royal Patron is Queen Elizabeth II, is partnering with leading luxury expedition cruise operator Silversea to share some of the world's most important geographical research and archive material with guests travelling on Silversea expedition ships, including Silver Explorer and Silver Galapagos. There are more than two million items in the Society's historic Collections, including over one million maps, 500,000 photographs, 250,000 books and journals, manuscripts, and iconic artefacts which date back as far as 1482. The Society has always been a notable supporter and communicator of the work of geographical explorers and scientists, including that of Charles Darwin, Dr. David Livingstone, Robert Falcon Scott, Sir Ernest Shackleton and Sir Edmund Hillary. Its support for geographical research to understand our changing world -- its environments, peoples and places -- continues actively today, informing issues that range from sea level change to migration. Silversea guests will benefit from a wide range of specialist visual and written content from the Society, enabling guests to learn even more about their expeditions to destinations including Antarctica, the Arctic, the Galápagos, South America, Africa and Europe. Founded in 1830, the Royal Geographical Society is a respected professional body for geography and geographers and is one of the largest and most innovative geographical societies in the world, as well as the biggest in Europe. Its objective is to advance geographical science. To do so, it champions and supports field research and scientific expeditions, enhances geographical and environmental education, and raises public understanding of the world. "This is a partnership which will bring incredible historic and current geographical information to our guests, as well as unite two experts in their respective fields," said Enzo Visone, CEO of Silversea Cruises. "Silversea Expeditions are known for being the best exploration voyages worldwide -- they will retain their world-class position with this valuable partnership with the Royal Geographical Society." "We are delighted to enter into partnership with Silversea, extending the Society's work to embrace and enthuse Silversea guests with our understanding of the wonderful and changing world in which we all live and that they will experience, enjoy and discover through their travel experiences," added Dr. Rita Gardner, director of the Royal Geographical Society (with IBG).